The U.S. Bureau of Labor Statistics showed employment increased by 151,000 jobs in August, below July’s gain of 275,000 jobs. Over the past three months, monthly job growth has averaged 232,000 jobs. The unemployment rate remained unchanged at 4.9% in August for the third consecutive month. 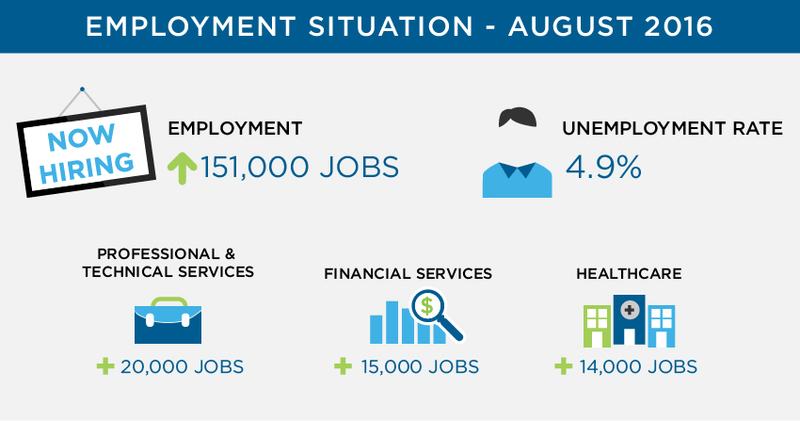 In August, professional and technical services added 20,000 jobs, employment in financial activities increased by 15,000 jobs, and healthcare employment rose by 14,000. Average hourly earnings rose 3 cents to $25.73. Over the year, average hourly earnings have risen by 2.4%. Professional and technical services added 20,000 jobs in August, in line with its average monthly gain of 24,000 over the year. Erika Baumgartner, Technical Recruiter of the Technology and Engineering Division in Las Vegas, commented on the change, “We have noticed hiring managers delaying making hiring decisions early in the process in order to pick from a larger talent pool. Employment in financial activities increased by 15,000 jobs, with 6,000 of the job gains occurring in securities, commodity contracts, and investments. Over the year, financial activities have added 167,000 jobs. Evan Levine, Executive Recruiter of the Finance & Accounting Division in San Diego, commented on the increase, “The steady increase in jobs over the year led to a rise in competitiveness from employers. Healthcare employment added 14,000 jobs in August, with 11,000 of the job gains occurring in hospitals and 13,000 in ambulatory healthcare services. This is a slower pace compared to its average monthly gain of 39,000 jobs over the prior 12 months. Miriam Madrid, Account Manager of the Healthcare Division in Las Vegas, commented on the increase, “We have seen an increase in Medical Billing positions as well as Medical Assistants for specialty clinics. With the economy nearing full employment, it is imperative that employers drive retention strategies in their organization in order to keep a fully staffed workforce. By investing in employee retention strategies, from new hire orientations to employee rewards systems, companies can ensure that their top talent feels appreciated and taken care of. Companies that fail to invest in employee retention run the risk of losing their top talent to competitors. For over 40 years, Eastridge has helped companies of all sizes maintain a fully staffed workforce while improving their hiring processes. Find out if the current employment situation means a new hiring tactic for your organization with our free eBook.